From Libya to Georgia, several individuals described to me the process of making their own special wine or unfermented grape juice for the Passover holiday. Some said that as children they couldn’t wait to stomp on the fresh grapes that were used to make actual wine, while others remembered helping their mothers or grandmothers combine dried grapes (raisins) with sugar and water to create a syrupy treat. Either way, it was a great activity for kids who looked forward to it year after year, and a new tradition that I started with my two girls this Passover. 1. Soak the raisins with the cold water in a large pot for 12 hours or overnight, covered. 2. 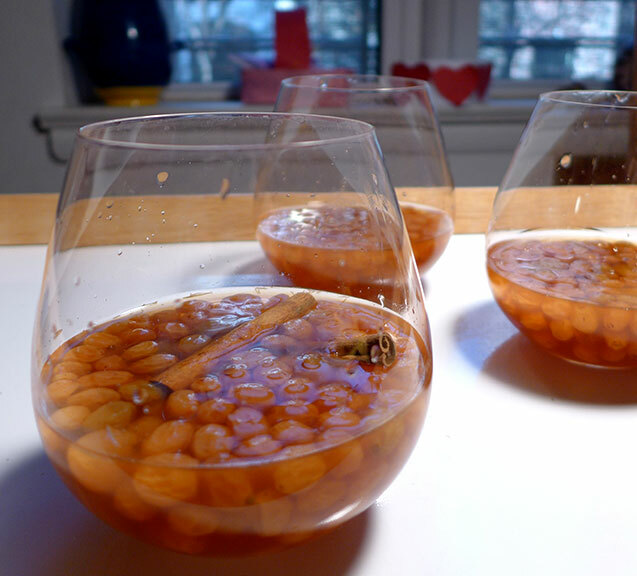 Bring pot of soaked raisins with the sugar and cinnamon sticks to a boil over high heat. 4. Remove from heat and cool completely before pouring into two large pitchers. Chill in the refrigerator for at least 3 hours or preferably 12 hours or overnight. Drink will keep in refrigerator for up to 1 week. ← Sephardic Culture: Walking and Tasting Tour in Bercelona!